1. 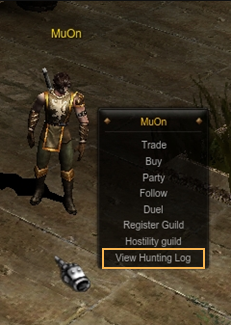 A window has been added for you to view character's hunting log. 2. 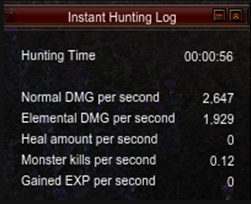 If you hunt with MU Helper, hunting log will be recorded automatically. (1) Hunting log is only recorded when you hunt through MU Helper (auto). 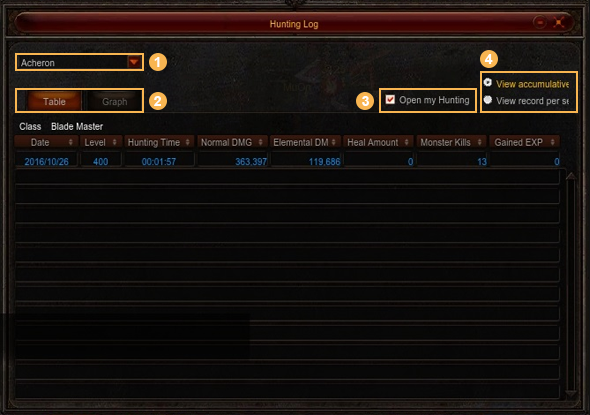 (2) Hunting log is recorded daily, and you can check up to 60 days' record at Hunting Log page. ① If you have new hunting log recorded while you already have 60 days' record, the oldest hunting log will be deleted. (3) Hunting log is enabled in the following fields. (1) You can open the window with Hunting Log Window Icon, or the hot key. ① Hunting Log Window Icon i. The window will open once you click the Hunting Log Window Icon on the top-left side of the game screen. ② Hot Key i. The window will open when you enter 'End' key on your keyboard. ① Select Hunting Field i. You can view hunting log for each hunting field. ii. Once you click the hunting field in the menu, you can see the field's hunting log. ② Table/Graph Screen Switch Tab i. 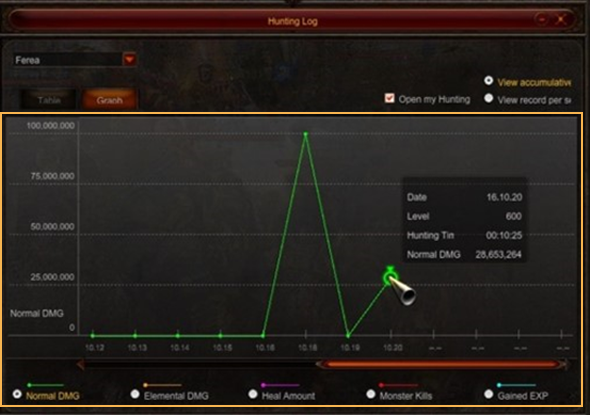 You can see the hunting log in a graph or a table. ii. Click the tab to view the hunting log in other formats. ③ Open My Hunting Log to Public i. You can open the Hunting Log Window to other users. ii. Once you click it, the Hunting Log Window will be available to other players. ④ Select Accumulated / Per Second Record i. 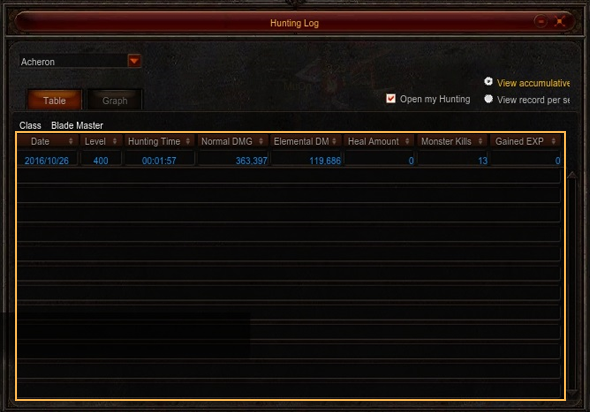 You can view the hunting log in accumulated / per second record. ii. Once you click it, the format for your hunting log will change. ① This is your hunting log in table format. ② The log shown in blue color at the top is today's log. The logs listed below are from the past dates. i. Today's log values are updated in real-time. ③ You can align numbers in ascending or descending order if you click the category name in the table. ① This is your hunting log in line graph format. ② Graph's Y-axis is value, and X-axis is date. ③ Once you click a point on a graph, a tooltip will be displayed to show detailed information. ④ You can see other hunting log graphs with the radio button on the bottom of the graph. (1) You can switch a large Hunting Log Window to a smaller one. (2) There are three ways to switch to a minimized window. ① Minimize Button i. When you click the Minimize button on the top side of the Hunting Log Window, the window will then switch to the minimized window. ② Hunting Log Window Icon i. When your Hunting Log Window is open, you can click the icon to switch to the minimized window. ③ Hot Key i. When the Hunting Log Window is open, you can enter 'End' key from the keyboard to switch to the minimized window. (3) You can check Instant Hunting Log in the minimized window. ① Instant Hunting Log is the record starting from the moment when MU Helper was operated and stopped. The log will be recorded again when the auto is run again. i. Hunting Log before running the program will be reset. (4) The minimized window will be switched to large size Hunting Log Window when you click the Maximize button on the top side of the minimized window. (1) Once you open your Hunting Log Window to public, other players can open your Hunting Log Window. (2) You can tick the check box 'Open My Hunting Log to Public' to open your logs. (1) You can open another player's Hunting Log Window, if the user has allowed it. (2) Once you Alt + mouse right click on another user's character and select 'View Hunting Log' menu, the user's Hunting Log Window will open.